Just a little stash flashing....one of these days, when I get all the yarn into its little cubbies, I'll do the total flash, but these are the most recent additions. 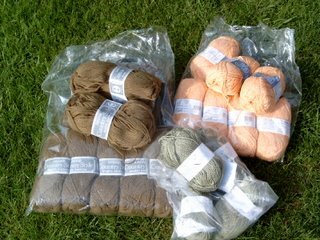 First, a lovely batch of Elann yarns, courtesy of my friend Jill (sending an "I'm not woooorthy" bow in her direction!). There's enough of the gorgeous lavender Highland Silk to make a sweater for moi - and that sweater is going to be Ivy from the most recent issue of Knitty. 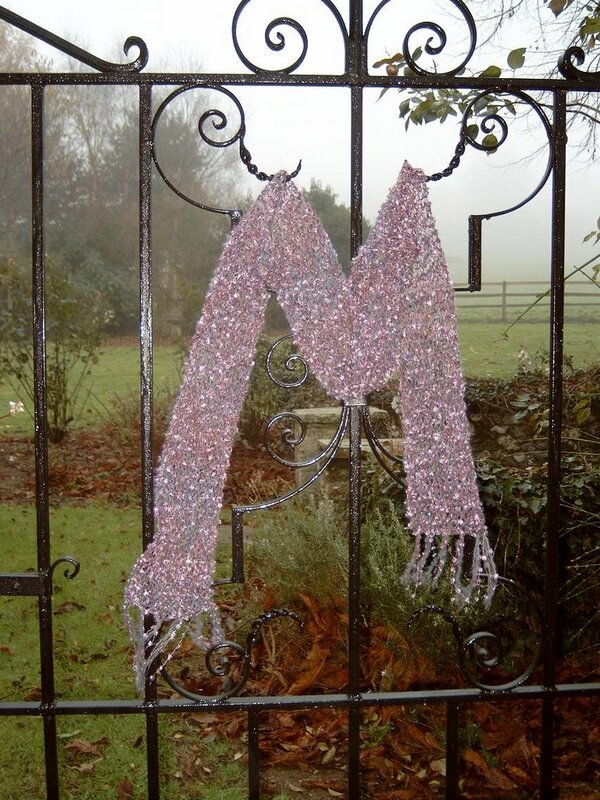 It's a gorgeous wrap sweater. 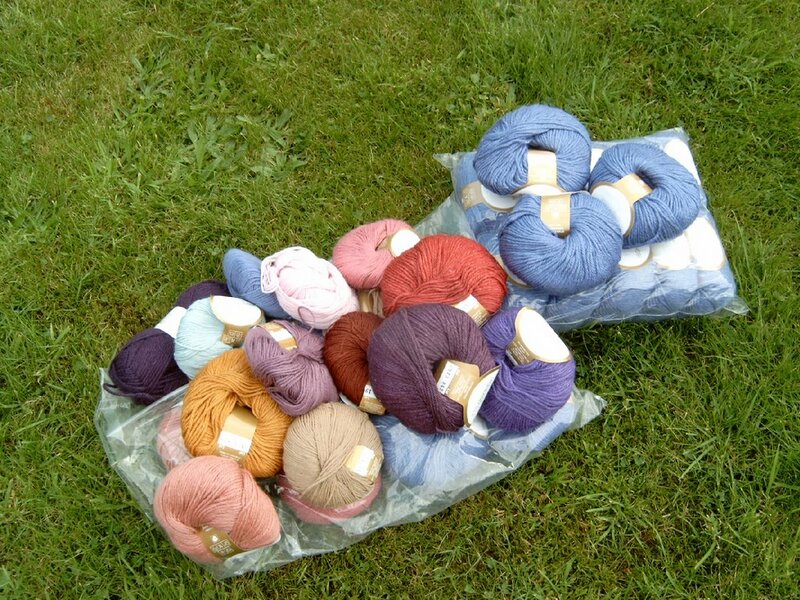 The other balls are more luscious Elann stuff like Highland Silk, Baby Cashmere....sigh... There are two balls of a soft blue missing that are earmarked for wrist warmers for my mom. Are you drooling yet? I am! This next batch is the result of an outing this week, when I had the chance to duck into a nearby wool shop. I did a little sale-bin diving, and came out with some irresistable bargains...the coffee wool is enough Sirdar Country Style for a vest or possibly a simple sweater for me; the celery green yarn has an interesting shine and I am thinking lacey something; the creamsicle-colored Jeans yarn is nicer in person. Really. 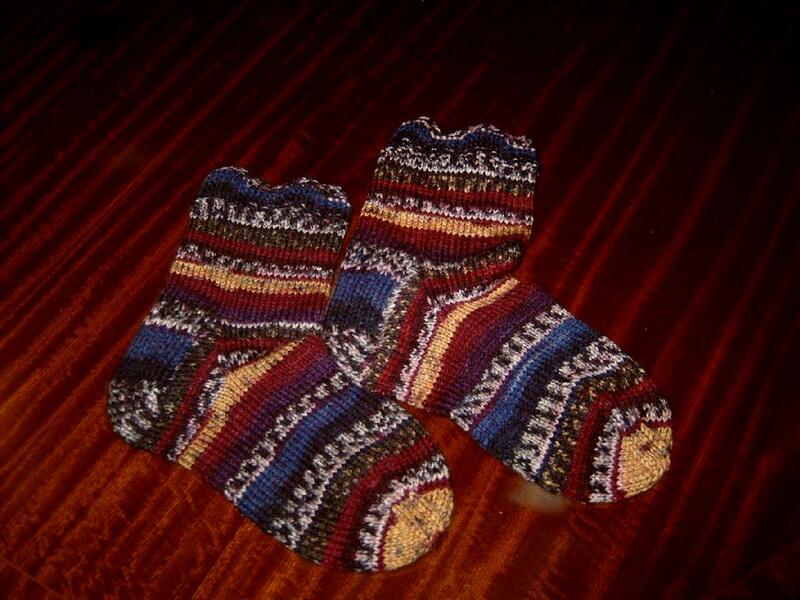 That may become socks for me and a cardigan for Lilybean. I'll have to play with it, as I am not sure it would work for socks. Exciting times around here, eh? Today I had the latest episode of Old-fashioned Village when the traveling knife grinder stopped in, to see if we had any kitchen or garden tools to be sharpened. I jest not. So I have formerly rusty, now wickedly sharp garden shears and loppers. Cooooool. I think he is a Traveller, as gypsies are called here. Very nice man. He spent the morning around the village sharpening this and that. No, I didn't get a picture of the gentleman, although he did have a very picturesque gold hoop earring. 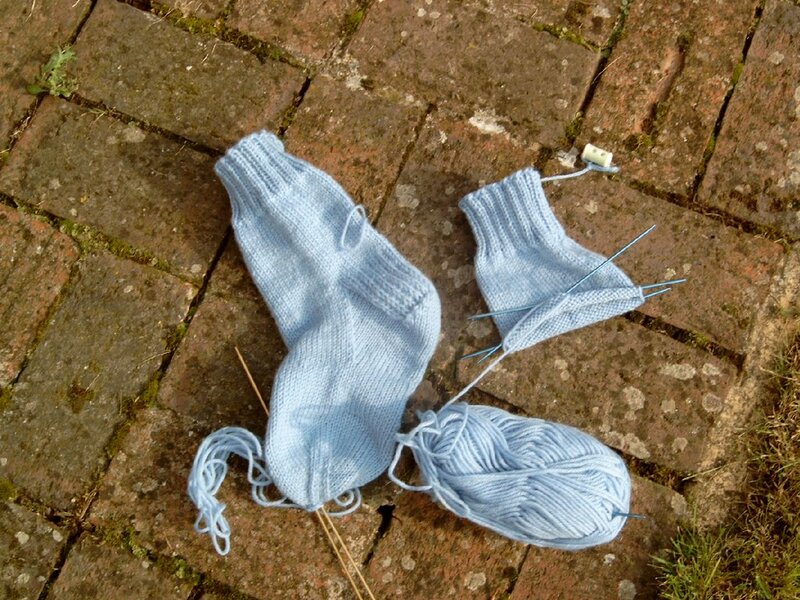 Then I spent a quality hour out in the knitting house working on the Vanilla Blue socks and gazing out of doors. Check out the progress - I am almost done. Fortunately for me, the first sock took only 1 skein of the yarn - you can see ALL the leftovers dangling from the still-ungrafted toe. 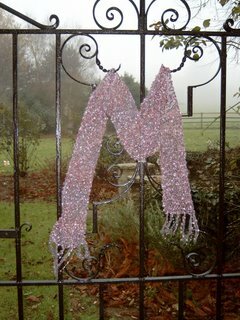 Check out the view from the knitting house door as well. This is its natural state - a little overgrown in the gravel forecourt, some garden tools visible, and Lil's scooter in the corner. 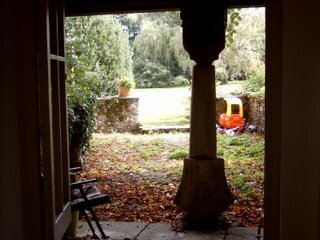 That column in the picture is one of my beloved 13th century columns, or so the man at our local castle tells me. They were re-used when the village church was restored in the 19th century. How groovy is that?! Check out this doll, specifically, check out the amazing hand-knit outfit. Ladies take second-hand dolls, and kit them out by knitting the most amazing doll clothes. Then the charity shops sell them for ... just about free. This was the most expensive doll I have seen, at 5 pounds. 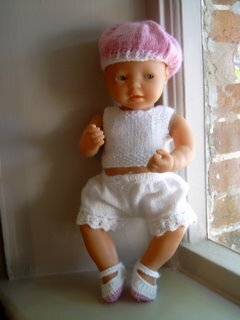 I could just about weep when I look at the amazing detail in the clothing - lace trimmed undies, knit smocking, picot edging. I can't do HALF this stuff, and if I did you can bet it would take me more than 5 pounds' worth of labor! Lily appreciates her anyway. She's named the new baby Shoe, because she has shoes. There ya go. Started these on 1 September. They are Vanilla Blue Socks, meaning my own plain old boring sock recipe. 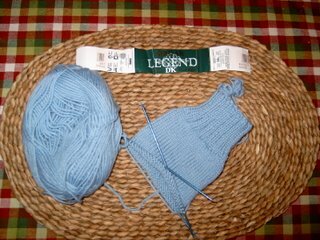 Sirdar Legend DK (stash), number 2 needles I think, and no pattern to speak of. 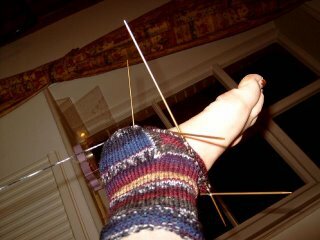 18 rows of ribbing, 30 rows of knit, and now the heel. Only worry is I may run short of yarn and need to make odd-colored toes. I only have two and 1/3 balls of this stuff and it's only 120 m/ball. 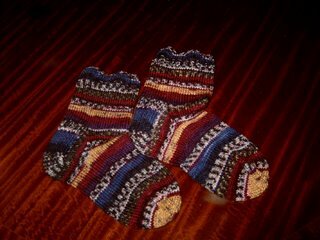 These were the socks I finished in August, but I didn't sign up until September for the Sock-A-Month 2 KAL, so I only get credit in my heart. These were knit in Moda Dea Sassy Stripes, on size 2 needles, I think. So, I haven't updated this at all since I created it. Two things, well, three, have given me a good shove to get it going again, however. 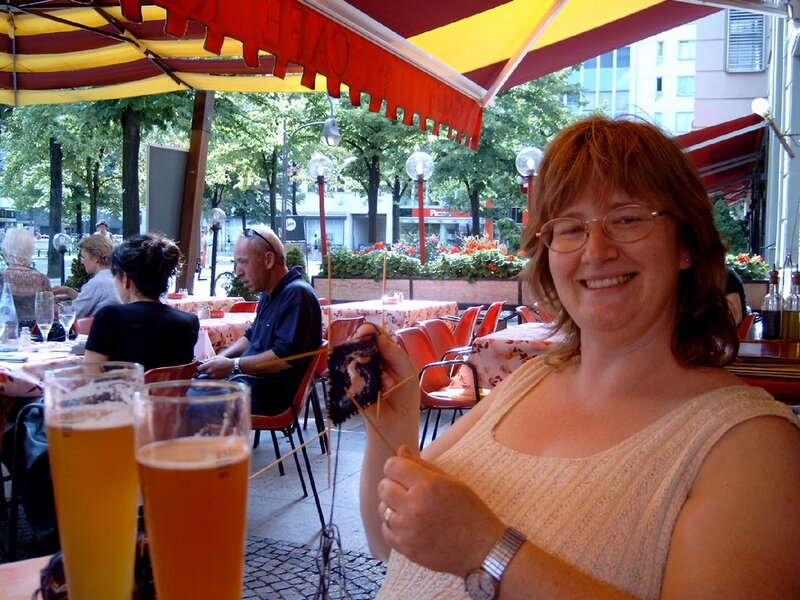 First, I am really enjoying my friend Lynn H's nifty knitting exploits in her blog. Second, joining the Sock-A-Month 2 KAL (see button in sidebar when I get that figured out) has given me a push to start using the knitblog for good, not apathy. 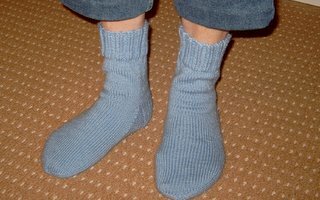 I want to show off my socks, y'all! Last but really most importantly, Jill (aka Saint Jill the Amazing Friend of All Friends) totally got the knitting house ready for action during her emergency rescue-stay with us in August (when mom broke both wrists and landed in hospital on the day David deployed....oh, yes, we were MIGHTILY thankful for Jill's help and company until things got a little better here). Let's review a bit. This year in knitting started with the Season of the Scarf - for some reason, it was all about the knitting in a straight line with interesting fibers. 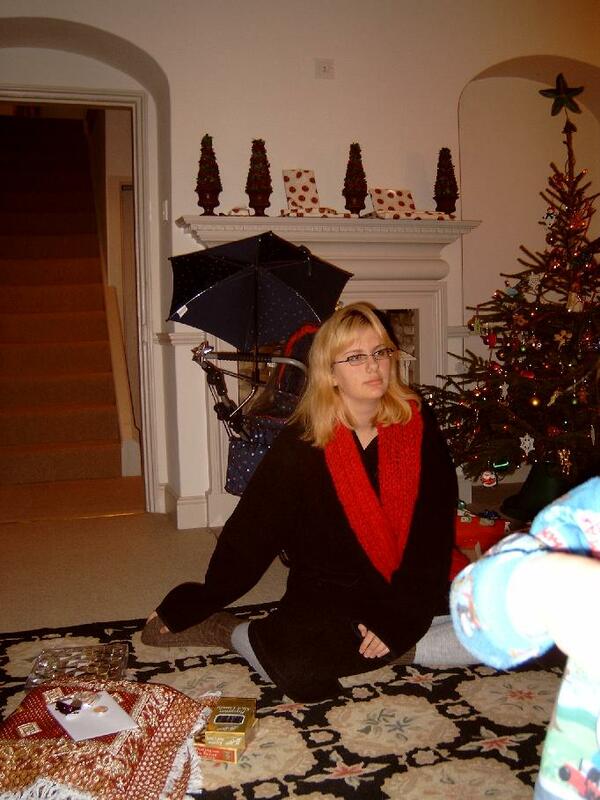 Maybe because it was cold and my hands couldn't handle the tough stitches? I'll post a few pictures from the Season here. 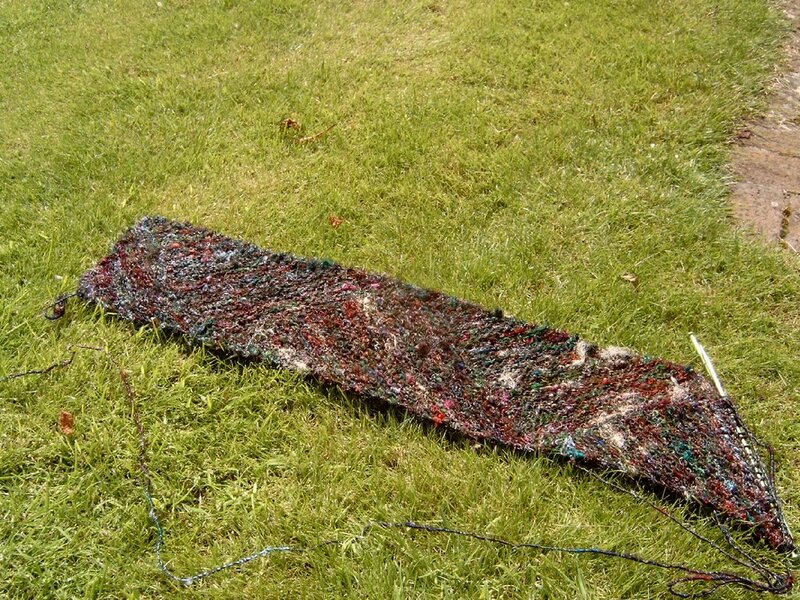 This next one is another use of stash, recycled sari silk knit in a sideways scarf pattern. It's much more luminous in person, sort of black with jewel green and red lights. 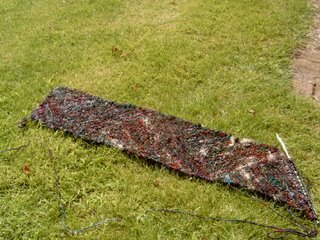 It's now about 5 feet long; still needs the final half-triangle and then is ready to wear. And this is my niece Clarke, who was here over the winter, wearing the red scarf I knit her (stash mohair, fisherman's rib) and looking very chic in her robe. Then with the approach of spring, it was Noro Time. I tried so many different things with the wonderful Noro Kureyon that Jill gave me for my 40th birthday (bless you, Jill!). As the beginning of a shrug, it went to see the Queen in February (see www.honsinger.net February archives), and finally, Susan Esser's Midnight Express vest pattern clicked. I am 90% done. 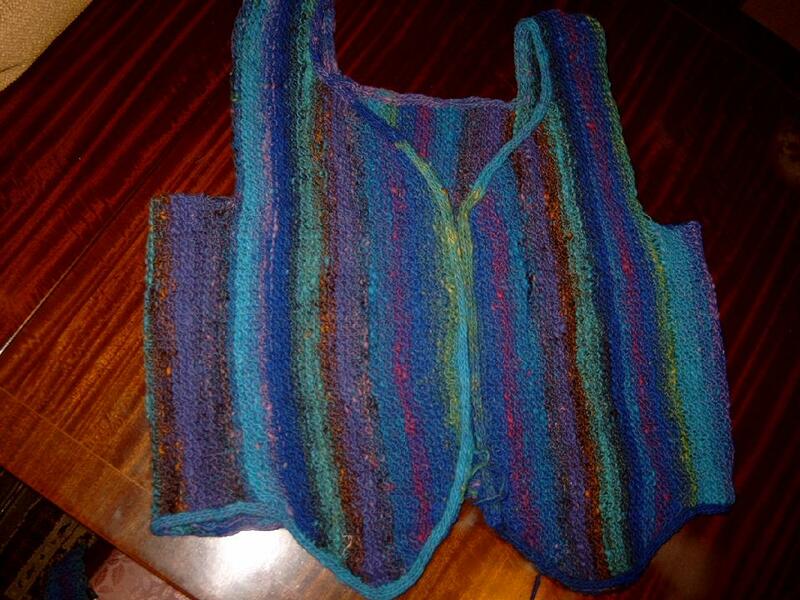 Just need to finish the I-cord edging on the armholes, and add the zipper, and then that baby's ready to wear.